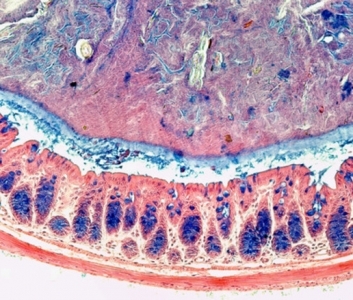 INRA TOXALIM and MICALIS research units, in collaboration with CNRS teams, investigated the potential effects on the intestinal mucus of TiO2, an additive present in nanoparticulate form in foods. Their results have just been published in the Journal of Nanobiotechnology. Titanium dioxide (TiO2) is a food additive commonly used in confectionery under the code E171. Toxalim, the research centre on food toxicology of Inra Occitanie-Toulouse, has been working for a long time on this element and its interactions with the digestive system. The risk of disruption of the intestinal barrier is indeed high when the molecule is present in nanoparticulate form. 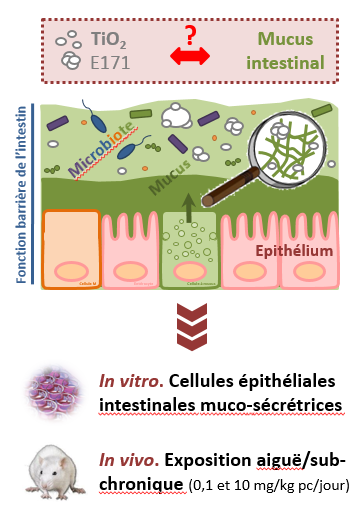 A collaboration between two INRA research units (TOXALIM Toulouse and MICALIS Jouy-en-Josas) and CNRS teams has tested the potential interaction of these nanoparticles with mucus, a key player in the barrier function of the intestine, which acts not only as a selective filter but also as an ecological niche for the gut microbiota. Researchers conducted experiments in both artificial (in vitro) and rat (in vivo) media. They used mucus-secreting intestinal cells for this purpose, and used the natural fluorescence of TiO2 to study it under a confocal microscope. After one hour of exposure, an accumulation of E171 particles was observed in the mucus. The experiment was continued in vivo with a daily oral exposure of the rat at levels similar to those described in humans (0.1 and 10 mg / kg body weight / day), either over one week or over two months. Regardless of the treatment considered, two key parameters of intestinal mucus functionality, namely the nature of mucin sugars, as well as short chain fatty acid levels, remain unchanged.